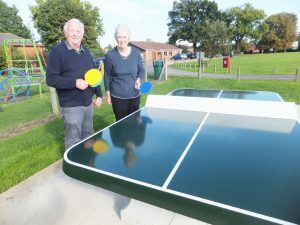 CHOBHAM has a brand new sporting facility – an outdoor community table tennis table on the Recreation Ground. The industrial-weight table is available for all villagers to use for free. “People in Chobham will be able to enjoy using this extremely robust table for years to come,” said Pat Tedder, who chairs the committee of parish councillors who run the Chobham Recreation Ground Charitable Trust and look after its facilities. “We are delighted to have it in place in time for half-term, so that children and teenagers will have a new source of entertainment for the school holidays.” But the recreation ground trust is definitely not imposing any age restriction on who uses it or limits on skill levels. It is aimed at people of all standards, from novice to the fastest-paced. The arrangements for using the table, situated next to the children’s play area, are simple – just turn up with your ping pong bats and balls and play. If you don’t have your own bats and balls, the parish clerk has a set in the parish office (situated in the parish pavilion on the recreation ground at Station Road), available to borrow when the office is open – currently Monday, Wednesdays and Thursdays, 9am-3pm. If there is a queue to play, then a courtesy-commonsense approach will operate – ie the unofficial rules are, please don’t hog the table for an excessive period if other people are waiting, and if you do have to wait for a little while to have your turn, please do so patiently. The table, manufactured by a specialist company in The Netherlands is made of concrete and iron and at 1500kg weighs more than a small car.